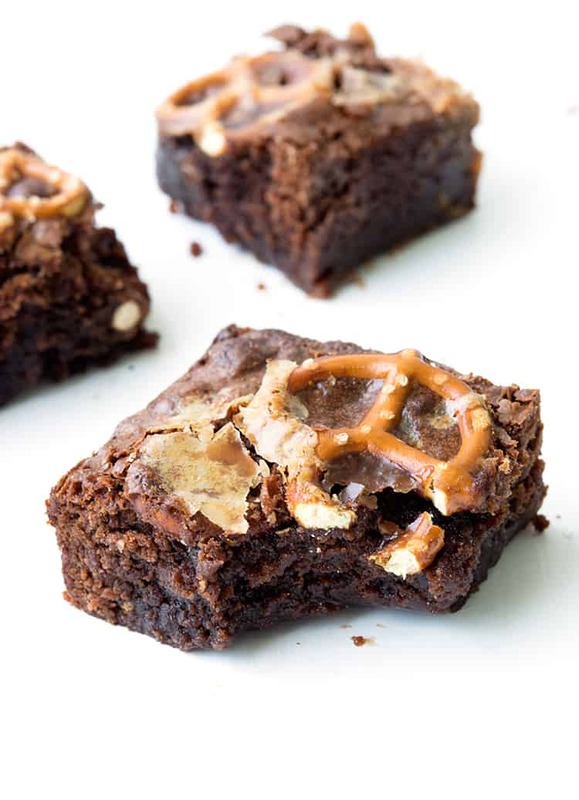 These Nutella Caramel Pretzels Brownies are next level. Made with real chocolate and Nutella and swirled with homemade caramel sauce and pretzels, they’re a sweet and salty delight. 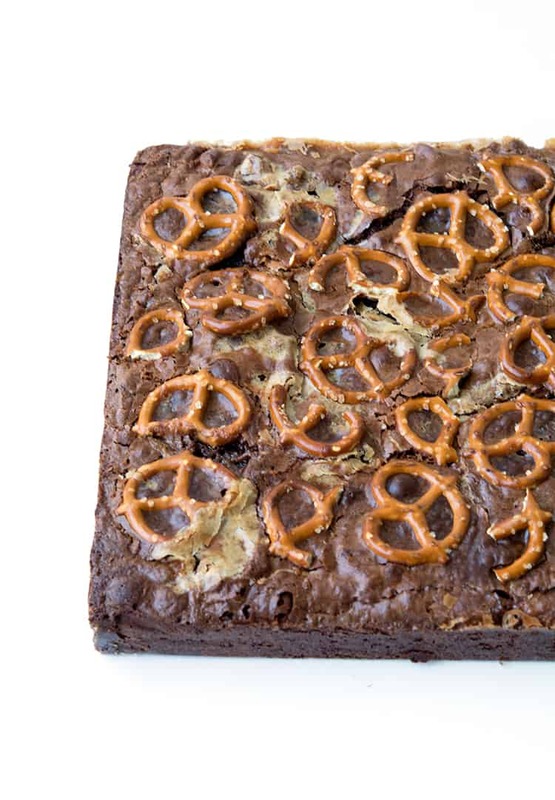 Three loves combine to make the most epic brownies EVER. Sweet and salty, extra fudgy and chewy-licious. Perfect with a big scoop of ice cream. 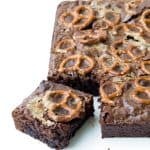 Made with real chocolate and Nutella, swirled with homemade caramel sauce and topped with crunchy, crushed pretzels, these Nutella Caramel Pretzel Brownies are the best! I LOVE brownies. And I know you do too. And boy have we made some good ones over the years. Remember my Snickers Brownies? Yes there are whole Snickers hidden INSIDE. And then there was my One Bowl Cocoa Brownies that can made in minutes – hello chocolatey goodness. OH and Peanut Butter and Jelly Chocolate Brownies with BIG swirls of peanut butter – yes please! 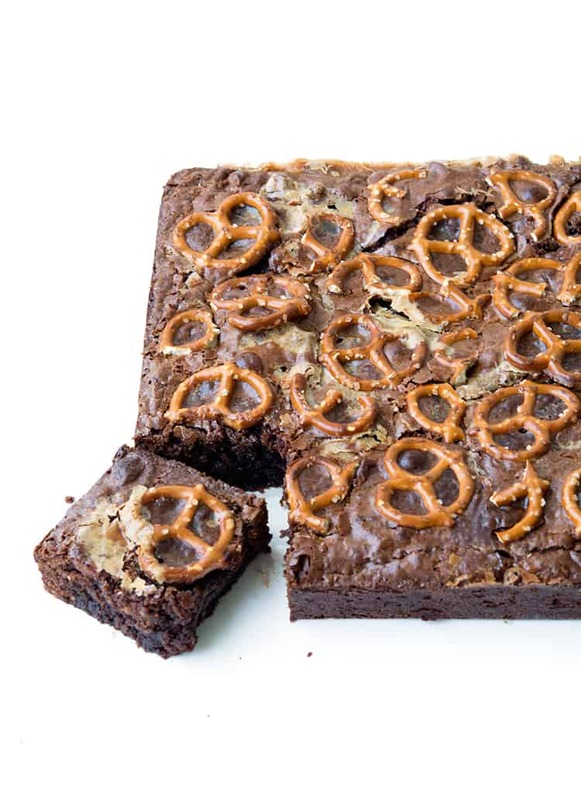 And JUST when you thought brownies couldn’t get even better, we go and make THESE. 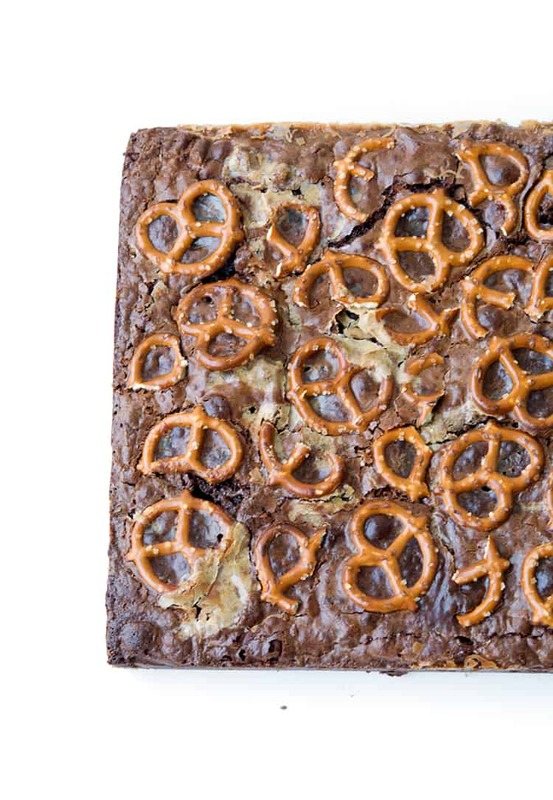 Nutella Caramel Pretzel Brownies. It all starts with a gooey chocolate brownie batter made with real dark chocolate and Nutella. Next up? Big swirls of homemade caramel sauce. And the grand finale is a sprinkling of broken salty pretzels. A little sweet, a little salty and a whole LOAD of DELICIOUSNESS. 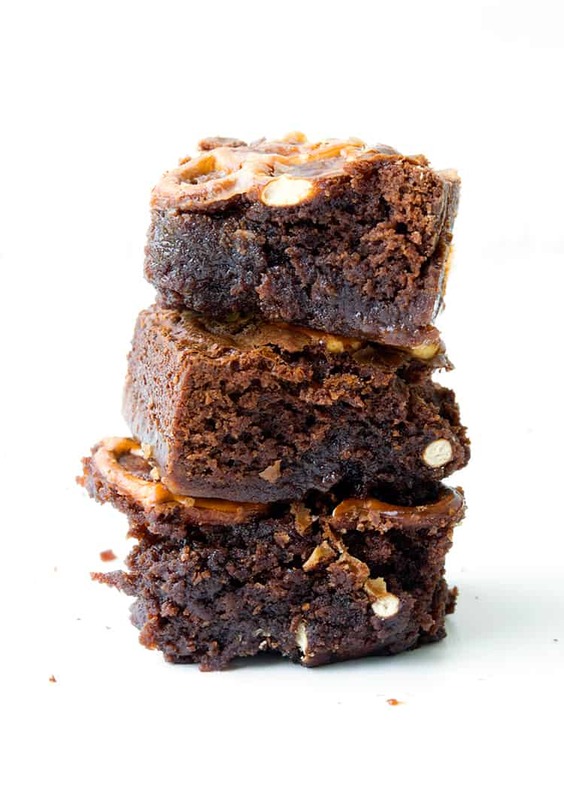 I used my homemade caramel sauce when I made these brownies, but I’m sure store-bought caramel sauce would work just as well if you’re a little strapped for time. My only piece of advice is to wait for the brownies to cool completely before cutting them because of their extra gooey middle.. You could even pop them into the fridge for a few hours so they firm up > that’s actually my secret for a super fudgy brownie. 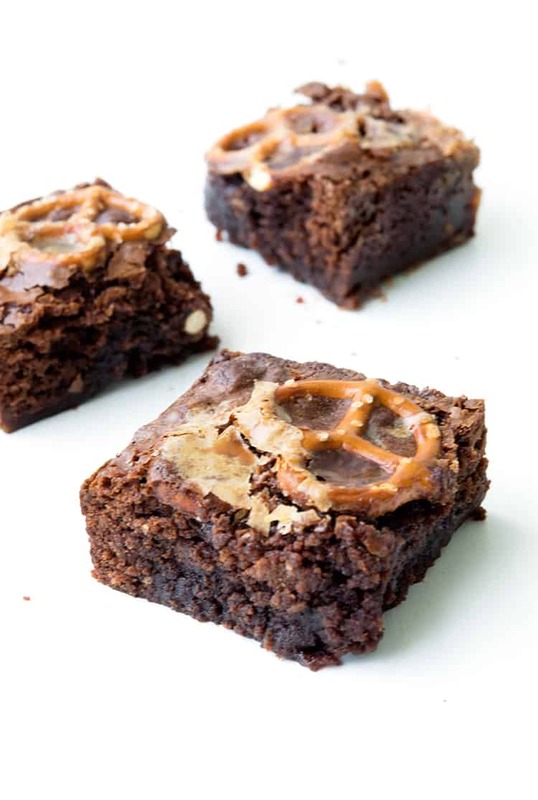 Gooey, fudge Nutella brownies topped with swirls of caramel and crushed salty pretzels. Preheat the oven to 160 C (320 F). Grease and line a square 8 inch cake tin with baking or parchment paper, ensuring two sides of the paper overhang. Add the butter and chocolate to a heatproof bowl and heat in the microwave, stirring every 30 seconds, until completely melted. Add Nutella and stir until the mixture is creamy and smooth. Add the sugar and vanilla and stir. Add the eggs, one at a time and stir. Then sift in the flour and stir until the brownie mixture is smooth. Pour the brownie batter into the prepared tin. Pour caramel sauce all over the top and gently swirl into the brownie batter using a butter knife. Press pretzel pieces on top. Bake the brownie for about 35-40 minutes or until cooked through. It should have a nice cracked top and no longer wobble in the middle. Leave to cool completely. Sweet and salty, what’s not to love? Gah sweet and salty desserts are my JAM!! These brownies look soooo good.